Neem is a boon for people with problematic skin. I get occasional breakouts after every few months and I never forget to stock a neem face wash in my bathroom cabinet. Bajaj Nomarks has recently launched new skincare products for problematic skin and I had already reviewed their new cream, scrub, face pack and oil control soap here on my blog. All of their products are really good and worth trying. 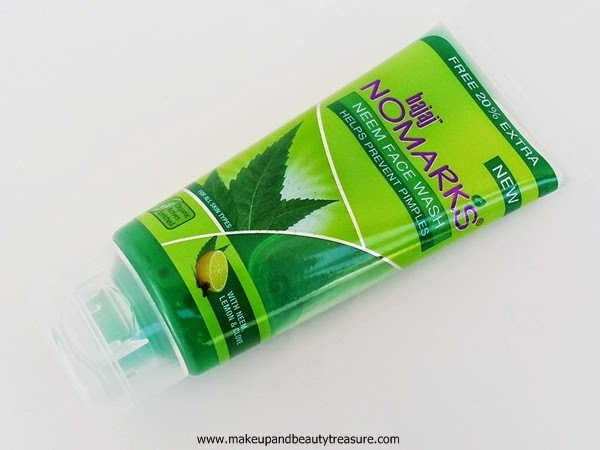 Today I am going to review Bajaj Nomarks Neem Face Wash.
Bajaj Nomarks Neem Face Wash comes in a sturdy clear squeezable plastic tube with a flip open lid. 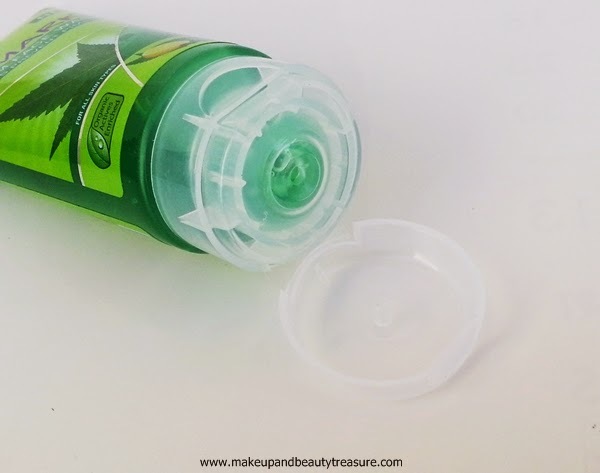 The lid is quite tight and the tube can be easily carried around in a bag without any fear of leakage or spillage. The face wash is bright green in color with a strong yet pleasant neem scent. The texture of the face wash is soft and smooth with gel like consistency. I take 50p sized amount of face wash for both face and neck. It does not lather much unlike other face washes but feels really soft and nice on the skin. I prefer face washes that lathers well so this kind of disappointed me a bit. The face wash gives a feeling of good cleansing. It washes away really quickly and does not leave greasy or sticky residue behind. 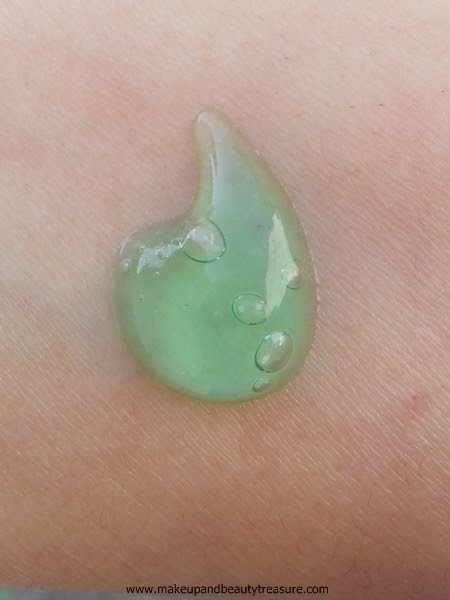 It also contains encapsulated neem beads that get crushed while massaging on skin. My skin feels fresh, smooth and thoroughly cleansed without any tightness. It removes dirt, oil and non waterproof makeup effectively but fails in removing waterproof makeup. The lovely smell does not linger with me and fades away as soon as it is rinsed off. It does not tighten my skin and I do not feel the need to moisturize my face immediately. It does help in preventing and reducing pimples and acne after a few days of continuous usage and keeps the skin clean and fresh. It also helps in reducing the redness caused by pimples. It contains Neem, Lemon and Clove that are a boon for pimple prone skin. I have not faced any adverse effects whilst using it. 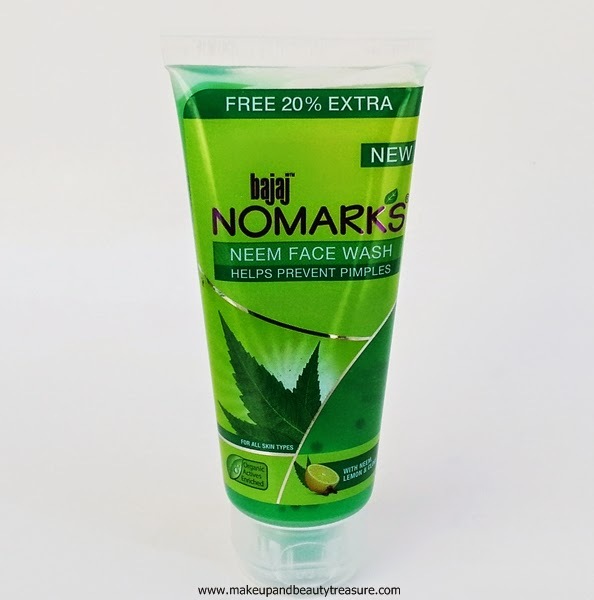 Bajaj Nomarks Neem Face Wash is a decent face wash that keeps your skin soft, smooth and clean. It does not dry out the skin and will suit all skin types. It controls and prevents pimples with regular usage. It would have been my favorite if it would have created good lather. If you have problematic skin then I would happily recommend it to you! 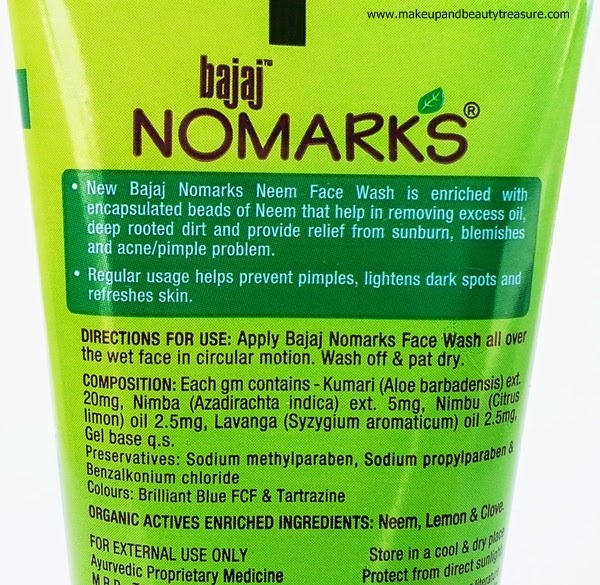 Have you tried Bajaj Nomarks Neem Face Wash? How was your experience? Share in the comments section below! I want to purchase this burst my nearby the shopkeeper said we don't have this plz can you tell from where I will purchase this face wash?